Friends who knew of our painful setbacks of child losses have sometimes gingerly turned to us for advice on how to extend words of encouragement and comfort to those friends of theirs in the same unfortunate predicament. We shared with them that during moments of such intense personal loss, couples prefer to have their personal space to grieve but yet be remembered in their family and friend's deeds and thoughts. They might yearn for those close to them to validate the pain they are experiencing. Every parent who has lost a child has dealt with disturbing, haunting questions. Why my child? Where is my baby now? Will I ever see my child again? 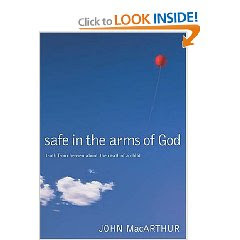 Renowned Bible expositor John MacArthur tackles the question of infant death (in the womb or following birth) in his trademark style--with detailed attention to Scriptures that hold the answers. No death occurs apart from the purposes of God, MacArthur assures readers, just as no life occurs apart from the purposes of God. With a pastor's heart, he leads readers to an understanding of the eternal destination of these precious little ones. 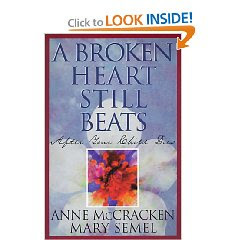 A devotional companion offering comfort, the reassurance of God’s presence, and strength for the journey through grief to healing for those who have lost a child through miscarriage, tubal pregnancy, stillbirth, or early infant death. 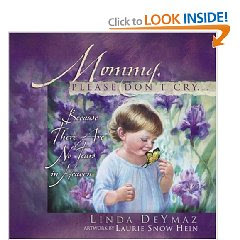 Mommy, Please Don't Cry is a book of love and comfort for mothers who have experienced the deep sorrow of losing a child. Serene illustrations frame gentle words that describe heaven from a child's perspective. With room for the reader's personal reflections at the end of the book, every page is a poignant gift of hope and healing. "Our stories are all different, but our pain is the same," writes Linda. 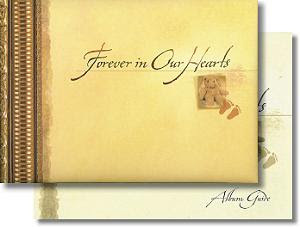 "We are mothers who will forever grieve the loss of our children. And yet, there is hope for our troubled souls." 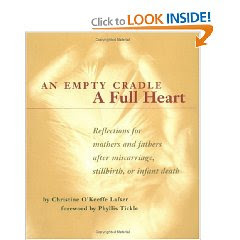 Nearly a million parents suffer a miscarriage or infant death each year. Theirs can be a lonely, quiet grief--with many emotions experienced but not easily expressed. 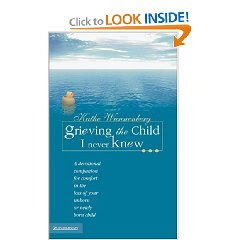 This collection of more than a hundred short meditations beautifully interweaves the very real feelings of bereaved parents with Scripture passages that provide comfort, direction, and a sense of hope. Twenty-three years after her son Nathan’s stillbirth, Cindy Claussen was filled with a need to write this story of hope and healing. Designed with soft colors and simple illustrations, the pages of Born to Fly– An Infant’s Journey God, contain Nathan’s conversation with God as he hears his father’s strong voice and experiences the sensation of his Mother’s warm touch for the first time. The simplicity of the story is what makes it so powerful. 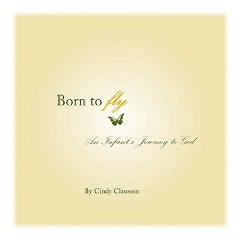 Born to Fly is indeed a little treasure that is sure to leave its delicate imprint on your heart. The book contains a remarkable miscellany of emotionally charged literature by the likes of Melville, Frost, Shelley, Irving and Shakespeare. Each selection describes bereavement in a different way, lending credence to the editors' belief that no one can claim to understand another person's particular loss or its effects. The excerpted literature is of impeccable quality, as are the sentiments behind each piece. This book does not seek to instruct the reader on how to cope with grief, it merely shares the beloquence of those who have been there before. Credit: All book covers and descriptions are taken from http://www.amazon.com/ but you can order these books through Kinokuniya (Singapore) bookweb services online. I'm sure if he could tell you, "Thank You," he would. I'm sure he would want you to know that he loved being a part of your lives even though brief. He remembers the belly rubs, soothing sounds of your voices, and the adrenalin of wanting him so badly. I'm sure if he could, he'd tell you he's with you forever. He will remember you both in his own angelic way, watching over you, holding onto your souls with his little hands and never releasing. He's all around you, touching your thoughts and hugging your memories. He smiles and laughs to comfort you each day you feel sad. He's happy for your strength and needs your hope to help him fly. I'm sure if he could tell you, "Thank You," he would, For all the powerful love, for remembering him, for holding him when he was born and missing him when he became your angel. He knows he is your combined, manifested pure love and he is your hope. He's the light in your window, he's the hope in your heart, he's the baby angel that throws the first snowflake upon your face- his kiss to Mommy and Daddy. Just know that the smiles on your faces help him get through his day, too, and he knows you love him, knows you miss him, and wants you to know that he's watching over you both. If he could tell you..I know he would. Nathaniel would be turning 5 this Saturday (10 Oct) but Mummy and Daddy would never be able to see how he looks like as a young boy now. 5 years have come and gone and in this duration, 2 more of our angels have joined Nat in Heaven. As we dedicate this week to remember our firstborn, I'd like to share an excerpt of what I journalled 5 years ago in an infant remembrance album given by a close friend when we lost Nat. Whenever the pain of losing you seems too much to bear and the grief too overwhelming, Mummy and Daddy would turn to God's word for comfort. Mummy would be reminded of the many Godly woman in the Bible who also experienced barreness and yearn for a child. Like Hannah and Elizabeth. How they never lose sight of God and continued to seek God's will. 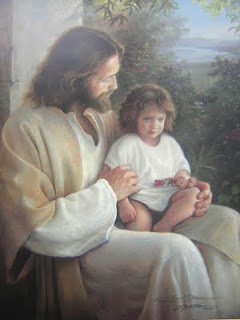 Daddy will turn to Jesus in his quiet time and intercede to God on our behalf for a miracle of a baby again. We sorrow but we do not despair because God has made our marriage stronger through this dark valley. Though we still don't know why God took you away, we rest in the blessed hope that God's grace is sufficient for us; for His strength is made perfect in our weakness (2 Cor 12:9). The Lord is close to those who have a broken heart (Psalm 34:18). and so Lord we pray you continue to heal us and restore the joy of salvation into our lives...till we see our baby face to face. Amen. We may not be able to hug you personally but you're sitting on Jesus' lap and He will give you the tightest hug sent right from Mummy and Daddy's hearts. We love you Nat, don't forget that.